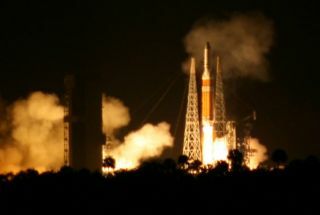 File photo: United Launch Alliance’s Delta 4-Heavy rocket blasts off carrying a new classified payload for the NRO in a successful Jan. 17, 2009 launch from Cape Canaveral Air Force Station in Florida. This story was updated at 7 a.m. ET, NOv. 18. One cannotoverstate the importance of Friday night's Delta 4-Heavy launch from CapeCanaveral to national security, a mission by the massive rocket that willdeploy "the largest satellite in the world" to hear the whispers ofevil. Countdown clocks are targeting a liftoff time of 6:06 p.m.EST (2306 GMT) from the Florida spaceport's Complex 37. The evening's available launchopportunity likely extends upwards of four hours. The originallaunch date of Thursday was delayed by 24 hours to fix an issue with groundpyrotechnics that release the big booster at liftoff. See our Mission Status Centerfor live coverage. UnitedLaunch Alliance's Delta 4-Heavy is America's biggestunmanned rocketcurrently in service, capable of lofting the largest and heftiest cargos. Themammoth vehicle is created by taking three Common Booster Cores -- the liquidhydrogen-fueled motor that forms a Delta 4-Medium's first stage -- andstrapping them together to form a triple-barrel rocket, and then adding anupper stage. The nighttime blastoff should be visuallyspectacular, lighting up the Space Coast with three distinct pillars of firefrom the main engines trailing more than 200 feet long. Ideal viewing spotsinclude off SR401 at Port Canaveral, along the 528 causeway or on theriverbanks in Titusville. Thunderingeastward across the open Atlantic, the rocket will soar out of sight within afew minutes as it embarks on a multi-hour mission to serve the U.S. NationalReconnaissance Office,the agency responsible for the country's fleet of intelligence-gatheringsatellites. The NRO's diversespacecraft,including telescope-like observers and communications collectors, uncoverlooming dangers to the nation and provide surveillance over the world's hotspots. "Alwaysvigilant, the NRO's eyes and ears give America's policy markers, intelligenceanalysts, warfighters and homeland securityspecialists the critical information they need to keep America safe, secure andfree," the agency says. Theclandestine payload going up this time, known only by its launch identificationnumber of NROL-32, is widely believed to be an essentialeavesdropping spacecraft that requires the powerful lift provided by the Delta4-Heavy to reach its listening post. In anaddress to the Air Force Association conference in September, NRO DirectorBruce Carlson, a retired Air Force general, said this rocket launch would carry"the largest satellite in the world on it." The NRO hasflown various types of communication-interceptors since the dawn of the spaceage, and analysts say it is virtually certain this Delta 4-Heavy is haulinganother. Destined forgeosynchronous orbit 22,300 miles above the planet, this new spacecraftsupposedly will unfurl an extremely lightweight but gigantically huge umbrella-likeantenna to overhear enemy communications and aid U.S. intelligence. "Thesatellite likely consists of sensitive radio receivers and an antenna generallybelieved to span up to 100 meters (328 feet) to gather electronic intelligencefor the National Security Agency," Molczan said. Observersthink the mesh antenna's diameter is the size of a football field, comparableto the International Space Station's remarkable width. That explains whysatellite-tracking hobbyists say these Mentor craft are "by far thebrightest" in the high-flying geosynchronous orbital perch to see from theground, outshining conventional television relay birds, weather sentinels andthe like. Although NROsatellites are secretive by nature, the spacecraft are visible by just lookingup. Molczan is member of a hobbyist group thatroutinely finds and watches the craft while monitoring the skies withprecision. But despitethe identity of this particular satellite being obvious, exactly where in thegeosynchronous belt it will be positioned and what part of the globe it willcover are details that remain hush-hush. "Theupcoming launch may replace one of the older spacecraft in the series, oraugment the fleet by occupying a new location in geosynchronous orbit," Molczan said. PreviousMentor satellites were launched by Titan 4 rockets from Cape Canaveral in 1995,1998 and 2003, plus the most recent Delta 4-Heavy in early 2009 carried one,according to the satellite-tracking hobbyists. The craftlineage can be traced to the two Magnum satellites trucked to orbit aboard thespace shuttle Discovery during the STS-51C mission in 1985 and STS-33 in 1989,historians have indicated. An evenearlier generation launched in the 1970s using Atlas rockets from the Cape,according to the authoritative Space Page website. Thursday'srocket launch continues a surge of NRO spy satellite deployments after alengthy 20-month lull. An Atlas 5 rocket began this ongoing campaign by dispatchinga new-generation radar imaging satellite in September from Vandenberg Air ForceBase, California. Carlson said"this is the most aggressive launch campaign that the NationalReconnaissance Office has had in 20 years, almost a quarter of a century." "Theother thing I can tell you is these are very important, because they all go toupdate a constellation which is aging rapidly. We bought most of our satellitesfor three, five, or eight years, and we're keeping them on orbit for ten,twelve, and up to twenty years," Carlson said. "Now,when I buy something people complain about how expensive it is, but nobody evercomplains when it's time to die and it keeps right on ticking. Some of theseguys are like the Energizer bunny and they have really done marvelous work. "We'redoing things that were designed to essentially operate during the era of theSoviet Union that are today doing tactical intelligence collection that leadsus to actionable intelligence on bad guys every day. Everyday. And we're doing it with equipment that's 15, 18, and 20 yearsold."